Does breaking seven mirrors bring 49 years of bad luck? Where did that idea come from any way? The inhabitants of this precariously perched village go about their lives hoping to keep the infernal finger of Fate pointed in the other direction by doing everything possible to avoid bad luck. 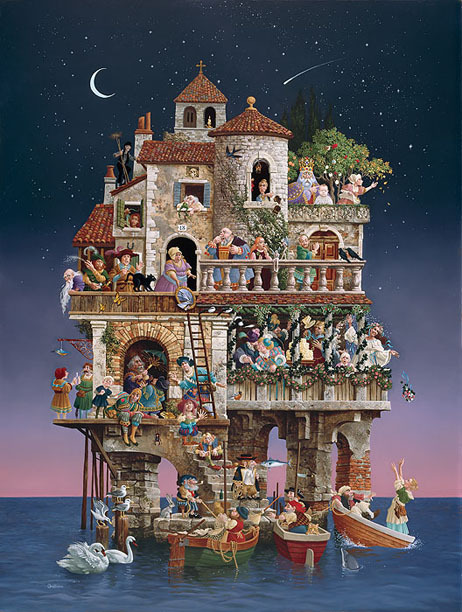 Can you find the 72 different superstitions James Christensen has included in this special Anniversary Edition release? Are you curious as to where all these superstitions originated; you can find them in the free booklet that will accompany your canvas.